MAPUTO, Mozambique, 27th February 2018 — Today, the USAID Reducing Opportunities for Unlawful Transport of Endangered Species (ROUTES) Partnership delivered a training workshop in Maputo for transport staff to learn how they can play a key role in helping prevent the trafficking of wildlife and wildlife products in Mozambique. 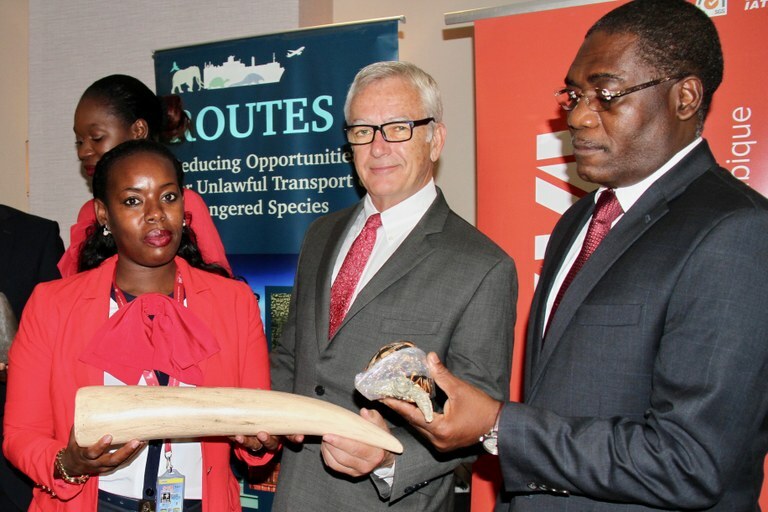 During the worship, cabin crew, ground handlers, cargo processors, and other regional airport staff learned how to detect and stop smugglers carrying ivory, rhino horn, and other wildlife products out of Mozambique. The USAID ROUTES workshop ensures that airport and airline staff recognizes common wildlife trafficking techniques and are equipped with the materials and resources to help protect Mozambique’s natural heritage from smugglers and traffickers. The training in Maputo was the first in a series of training workshops that ROUTES will be conducting for airport and airline staff this year at key wildlife trafficking hubs across Africa. Over the next few months, ROUTES will hold training sessions in Kenya, Uganda, Malawi, and Ethiopia. The United States Agency for International Development (USAID) leads the U.S. Government’s foreign assistance efforts. In Mozambique, USAID works in the areas of health, primary education, economic growth and governance. For more information please visit usaid.gov/mozambique or follow @USAIDMozambique on Facebook and Twitter.